The beautiful Lake Tawakoni area, holds the titles for Catfish Capital of Texas as well as the Bluebird Capital of Texas. The lake is formed from an iron bridge dam of the Sabine River, 50 miles east of Dallas. The Tawakoni name is derived from the Native American Indian tribes of the area, meaning "river bend among red sand hills". It is on one of these red sand hills, in the town of East Tawakoni, that the LSGTPA tractor pulling teams gathered for the first event of the 2012 season. The sandy soil made for an excellent 200 foot pulling track, upon which the thirty-plus tractors in attendance pulled for the first title of the season, in front of a great crowd. The Youth Class started the show, and saw Katyn Yarborough taking the title. Aidan Hovind placed second with his 'Yes Deere' machine followed by Cassidy Bramlett in third. Jared Stephan brought home a fourth place trophy in his pulling debut, and returning 2011 champion Kody Langham and Lane Duncan's 'Texas T-Rex' rounded out the top of the class. In Stock, Kolby Langham took the top honors, followed by Claude Lewis and Chris Harper for the top three. Curtis Felps turned in a fourth place finish followed by Jaron Howdeshell and Steve Mccarley. In Big Stock, it was Team Aufdenkamp dominating the field, as John and Shawn Aufdenkamp finished one-two. Kolby Langham and Patrick Bramlett turned in Full Pulls, to hold on to the third and fourth place slots, while Len Hickerson finished fifth in a very close field. Michael Mayberry piloted his 'Pulling for Peanuts' entry over Shawn Aufdenkamp, to take the Stock Altered title, while Ken Langham took the Super Stock honors. John Aufdenkamp used a great pull aboard his 'Three of a Kind' triple engine tractor, to take the Outlaw Class title. Len Hickerson, Steve Pierce and Claude Lewis, Jr. finished 1-2-3 in the Motorcycle Class. After the smoke cleared in the Mini Rod class, Sarah Moody had placed her '99% Moody' John Deere at the top of the hill. James Moody followed, by just over one foot, while Jerry Toland and Thomas Kimmons rounded out the top of the field. The always entertaining Super Rod tractors closed the show, with Randall Moody taking the win aboard the 'Ridge Runner'. Jerry Toland used some great driving skill to take his wild 'Dodge This' tractor down the track for a second place finish, while Tyler McCarley took the 'ScatCat' tractor to a third place finish. 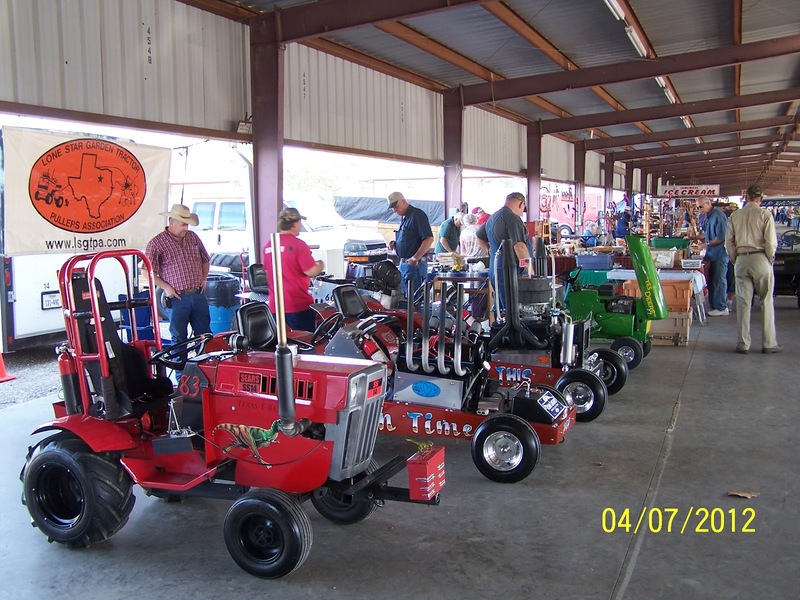 James Moody and Sam Carroll rounded out the top five Super Rod tractors. Opening Day has been celebrated in ballparks across the nation, and this weekend, it will be the LSGTPA celebrating Opening Day ! 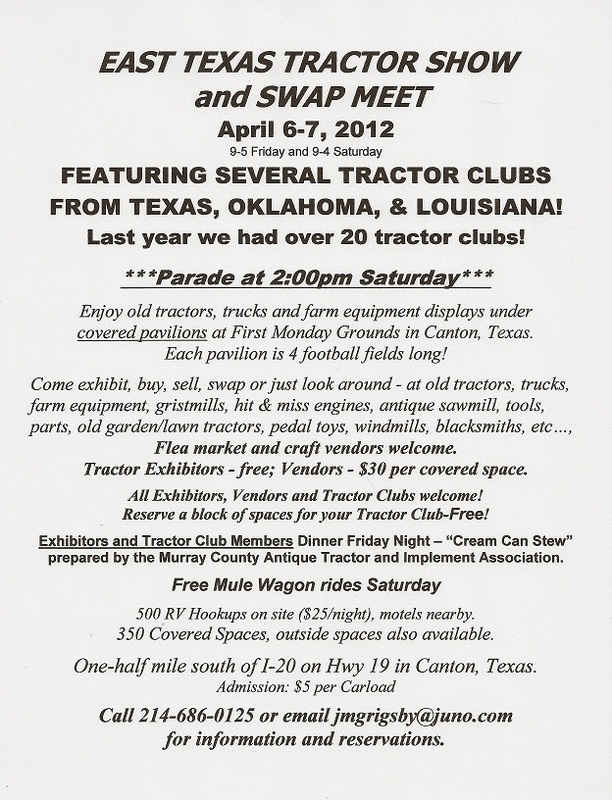 The first pull of the season will begin this Saturday in East Tawakoni, at the Spirit of East Tawakoni Tractor Pull. The weather forecast looks great for a pull by the lake, and the event is scheduled to begin at 11am, with a National Anthem presentation by Haley Harrelson. Teams from across Texas are expected to unload at the new track, near Lake Tawakoni, with the intentions of starting the 2012 season off with a win. With the goal of each team the same, it would be a sure bet that the competition will be tough ! See the LSGTPA website for a map and directions, and come see the event as the LSGTPA pullers shake the lake with horsepower ! Haley Harrelson will perform the National Anthem during opening ceremonies on Saturday at East Tawakoni. 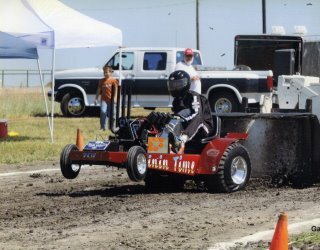 Jerry Toland is one of many pullers, scheduled to compete during the Spirit of East Tawakoni Tractor Pull on Saturday at East Tawakoni. 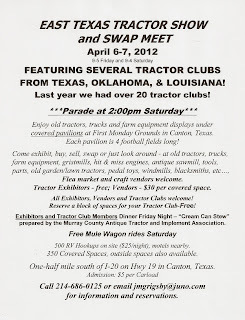 Several LSGTPA tractor pulling teams are planning to display their machines at the East Texas Tractor Show, in Canton, Texas on April 6-7. The Friday and Saturday event begins at 9am each morning, with a parade slated for Saturday at 2pm.